Brock has always been interested in travel. While he was growing up, trips with the family were always special occasions to him. Being born on the west coast and living up and down the east coast has given him a desire to travel as much as possible in order to see and experience new places and people. After joining MEI & Mouse Fan Travel, he was able to combine that passion for travel and his training in customer service to help numerous people celebrate a variety of special occasions. Ever since his first trip to Walt Disney World with his family, Brock has had a special love for anything Disney. He has been fortunate enough to visit all of the U.S. parks and the Tokyo Disneyland Resort, experience the magic of Adventures by Disney, and sail on all of the Disney Cruise Line ships. 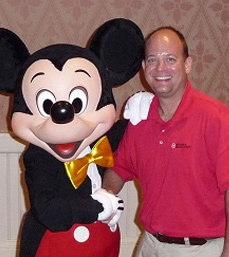 Besides Disney's many travel opportunities, Brock also specializes in cruising and guided tours around the world. Having sailed on and completed certifications and training sessions for multiple cruise lines, he’s well-versed in the offerings from all the major river and ocean cruising companies, as well as the top guided tour providers. He consistently help groups (both large and small), families, and individual travelers experience new adventures and create lasting memories.